So you have (or want) baby chinchillas! 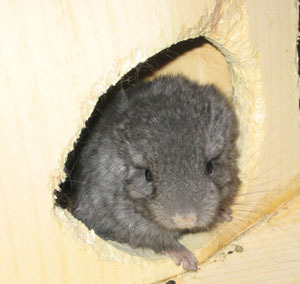 Possibly the cutest rodent infant, baby chinchillas (or kits) are fragile, but they mature quickly. If you keep the male with the female after birth (for a breedback) make sure you provide a baby creep for the young ones to hide in. This could be served by a large glass water bottle, or slightly depressed can (so it can't roll) with no sharp edges. If you breed make sure you are prepared to handfeed in case the kit is not getting enough nourishment from the mother (often is case of litters of four or five), or there has been medical complications. Make sure the kit is nursing by weighing the chinchilla to see if it's gaining weight. You can try adding some fruit juice to the water bottle (in addition to having a regular water bottle) - use non-sweetened apple juice. If you need to hand feed replacement milk could be one can of goat's milk, one can of water and one tablespoon of baby rice cereal. Kits should be weaned at 6 to 8 weeks old. You don't want to leave a male kit with the mother past 3 months for obvious reasons! If the dad has been separated from the mother you may leave a female kit with the mother as long as you'd like. 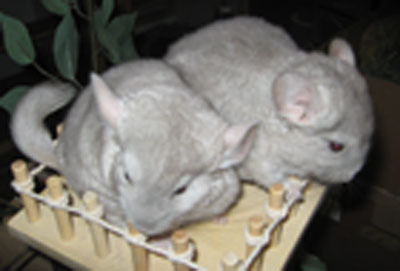 Once the kits have been weaned try to pair them up with chinchillas of similar ages to continue their socialization process (it's much better to have friendly chinchillas!). Baby chinchillas come from breeding!